The original animated Dumbo (1941) clocks in at only 64 minutes, a relic of the days when an afternoon at the movies meant a double feature with cartoons in between. 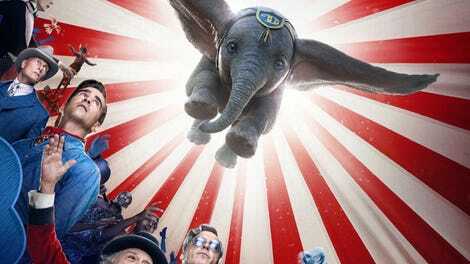 Now, in an era when movies must be events unto themselves, Disney’s live-action redo of its flying-elephant fable runs just under two hours. That necessitates either a whole lot of padding or a complete rewrite; screenwriter Ehren Kruger, who’s new to the Disney machine but not to blockbuster filmmaking, splits the difference by keeping the barest minimum of the original plot and bulking it up with new characters and themes. Most of these are wholly expected—kudos to whoever gave a presentation to Disney brass on the importance of STEM education for girls, which has made it into two live-action films in a row. 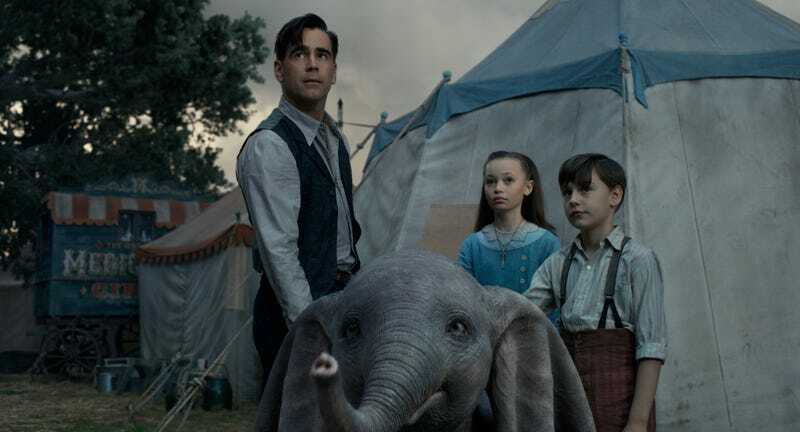 But there’s one plotline in the reimagined Dumbo that’s truly surprising, and even ballsy, when you think about it. Basically, the movie offers a metaphor for the evils of corporate mergers, with villainous circus mogul V.A. Vandevere (Michael Keaton) standing in for Disney itself. Of course, it’s almost certainly a coincidence that Dumbo is coming out one week after the Disney/Fox merger was finalized. But what else are we to think of when independent circus owner Max Medici (Danny DeVito) is persuaded to let his little traveling carnival, which recently hit the jackpot with the birth of a flying elephant named Dumbo, be absorbed into Vandevere’s big one, under the the (breakable) promise that his makeshift family of sideshow performers keep their jobs? The P.T. Barnum-esque Vandevere likes to buy up other operations, then pair off their star attractions with his own; in this case, the new act is a collaboration between Dumbo and the elegant, honorable French trapeze artist Colette Marchant (Eva Green), who previously headlined Vandevere’s circus under the banner of “Queen Of The Air.” And did we mention that the bad guy owns a giant theme park called Dreamland, where he displays his talented lackeys alongside an exhibit of animatronic figures demonstrating the fabulous innovations of tomorrow? The metaphor tracks, though it’s anyone’s guess how it survived its trip down the corporate line. But while Dumbo himself is adorable, he isn’t especially Burton-esque, and neither is the rest of the film. Its sideshow and circus elements are period accurate but surprisingly lack any of that creepy-crawly Burton flair, save for isolated moments like a ghastly smash cut to a shot of a clown’s cackling face as fire burns around him. (Don’t worry, kids, it’s all part of the show.) The slightly sinister fantasia of Dreamland is more up the director’s alley, working in some of his signature Art Deco elements even though the story takes place in 1919, half a decade before that particular aesthetic movement really took off. Here, in a land fueled by imagination, we see the whimsical touches of an auteur long since absorbed into the Hollywood system: Burton affectionately reaches out to monster-obsessed kids with Nightmare Island, a Dreamland attraction where a dog in a plaid coat becomes a werewolf and an alligator with cardboard fins becomes “Reptzilla.” And while familiar, the film’s core theme of embracing the things that make you different carries an extra crumb of emotional weight, coming as it does from the director of Edward Scissorhands. Speaking of that film, Alan Arkin appears in a small role as a demanding financier; he’s one of many in the cast who are on their second, third, or—in the case of Danny DeVito—fourth Tim Burton project. Johnny Depp’s not part of the ensemble, presumably due to a number of recent incidents that have tarnished his reputation enough to make him an inappropriate casting choice for a family film. But Keaton’s eccentric ringmaster role may very well have been originally written with him in mind. It certainly plays that way, although Keaton’s performance is several degrees less outrageous than Depp’s presumably would have been. No one gets the chance to truly showboat, least of all the bland family of protagonists, including Colin Farrell as widowed, one-armed horse trainer Holt Farrier; newcomer Nico Parker as his science-obsessed daughter Milly; and Finley Hobbins as his son Joe, who doesn’t even have a singular character trait to go in front of his name. Farrell’s Kentucky accent here is as merely passable as his Chicago accent in Widows was, and Parker’s precocious interest in physics and chemistry seems similarly phoned-in. Both characters are just there to keep the story moving, to provide awestruck reaction shots as we move from oddly muted spectacle to agreeable callback to the heartwarming happy ending. And yes, these are all symptoms of the same relentless conformist drumbeat the film is critiquing in its script. But what’s more Disney than Disney controlling the ways in which a filmmaker can critique Disney?